2017 was “historically the best year for Cuba,” according to its Tourism Ministry, but the steep decline in U.S. travelers is affecting the island. Cuba had a 7 percent decline in overall tourism during the first three months of 2018, partly caused by a sharp drop in U.S. travel to the island, according to official data released Tuesday. American travel to the Caribbean island is only 56.6 percent of what it was in 2017, said Michel Bernal, the commercial director for the Cuban Tourism Ministry during a news conference on Tuesday. A number of issues have led to the steep decrease in U.S. tourism. President Donald Trump’s tightening of travel restrictions, mysterious health attacks that prompted the State Department to issue a travel warning and the effects of Hurricane Irma have all contributed. Bernal said that 2017 was “historically the best year for Cuba.” Tuesday marked the day in which one million tourists visited the island since January. It hit the mark eight days later than in 2017. 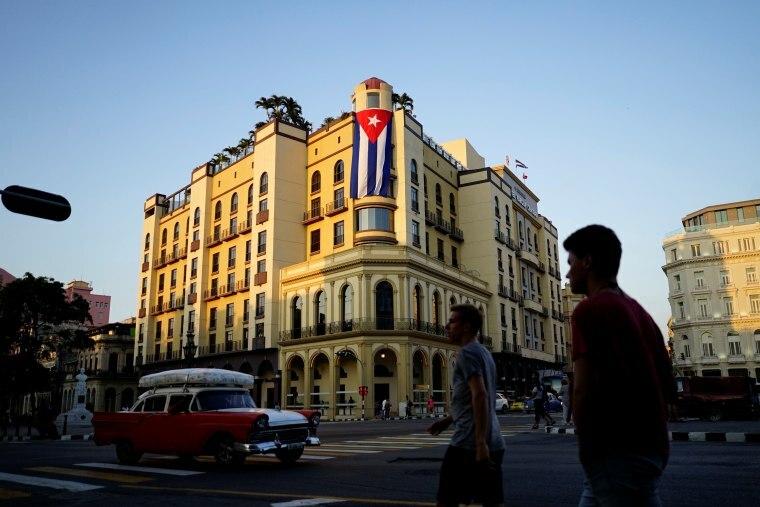 What impact will leadership change have in Cuba? During the first trimester of 2018, the top visitors to Cuba were Canadians, followed by Cuban-Americans and other Cubans living abroad. This last group had an increase of 21 percent in comparison to the same period last year. The third largest group of travelers were Americans. With the re-establishment of diplomatic relations between the U.S. and Cuba, Americans’ ability to travel to Cuba changed drastically. Before the announcement, in December 2014, most Americans who did not have family ties to Cuba could travel to the island only on guided tours dedicated to “meaningful interaction” with the Cuban people. Activities that could be considered tourism are illegal under U.S. law. In Cuba, U.S. tour companies contracted guides, tour buses and hotel rooms from the Cuban government before the detente. Under the President Barack Obama’s administration, the requirement to travel on guided tours were eliminated and Americans were allowed to travel to Cuba on individual “people to people” trips. It was similar to travel anywhere in the world except beach resorts were off limits. As a result, U.S. travel to Cuba exploded.Commercial flights between the U.S. and Cuba resumed after more than half a century and Airbnb was allowed to operate in Cuba. By the time Obama left office, American travel to Cuba had tripled. Because Americans could not stay in resorts, U.S. travelers poured hundreds of millions of dollars into privately owned restaurants and bed-and-breakfasts. They were essentially supporting Cuba’s emerging private sector. In 2017, Cuba received 1.5 million visitors from the U.S., including Cuban-Americans. In total, they had 4.7 million visitors, which was a 16 percent increase from 2016. Then, Hurricane Irma, a category 5 storm, rammed into the island in September causing billions in damages. The tourism industry felt the impact, though it was the central coastal provinces of the island that were most affected. Also, last October, mysterious attacks that caused health ailments in 24 Americans affiliated to the embassy in Havana caused the State Department to withdraw personnel by 60 percent. They made the decision permanent last month. There is also a travel advisory warning Americans to “reconsider” traveling to Cuba. Cuban officials have denied any involvement or knowledge of the attacks. Finally, in November, the Trump administration implemented new travel restrictions. Americans, once again, have to travel as part of organized tour groups run by U.S. companies. The regulations also include a ban on Americans doing business with the large military-run corporations that control the Cuban economy. The aim of Trump’s policy is to prevent the military, intelligence and security arms of the Communist government from benefiting from American tourism. But many Cuban analysts agree the policy does just the opposite. When traveling on a cruise, most of the dining and the overnight stays occur on the ship resulting in less accommodations and meals on the island. Also, the routes may include multiple destinations in the Caribbean, diminishing the amount of time spent in Cuba. “Many spend one night in Havana … that is counted as a visitation,” Popper said. Popper said he had seen a 35 percent drop in web traffic and bookings last Fall but is now gaining steam again. The Cuban government remains “optimistic” it will hit their 5 million goal this year, according to Bernal. Additional reporting by NBC News producer Orlando Matos in Havana.